In one of the most substantial contributions by an Objectivist author since Ayn Rand's death, Andrew Bernstein makes the complete moral and practical case for capitalism. ...Buy it. Study it. Give it to friends! Since its publication in 1848, The Communist Manifesto has served as the seminal propaganda piece to spread communism and socialism around the globe. For more than 150 years, idealistic students have read the book, discussed it, memorized its tenets, studied its tactics, and passed it on to friends. As a result, it became one of the world’s most influential political tracts. Among the key measures Marx and Engels called for were the confiscation of privately owned land, a progressive income tax, and the abolition of inheritance from one generation to the next. These were powerful ideas, and they achieved powerfully bad results. The Communist Manifesto helped inspire countless political movements which — in Russia and Asia alone — would kill some 130 million people before the close of the Twentieth Century. To say the book deserves an uncompromising rebuttal would be an understatement. But what would such a rebuttal consist of? Where does one even begin to counter ideas which maintain such seductive appeal that they could survive in the public eye, virtually unscathed, despite the slaughter of millions of innocents? The Communist Manifesto may never see a more dramatic rebuttal than the one provided in Ayn Rand’s Atlas Shrugged. But that was a novel, with considerable restrictions on the amount and type of information that could be included. The full demolition of communist ideals — in the form of an unapologetic review of capitalism’s moral and practical achievements — deserves a comprehensive and uncompromising treatment in non-fiction format. This is exactly what Dr. Andrew Bernstein provides in his newest book, The Capitalist Manifesto (2005, University Press of America). 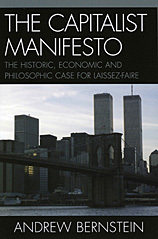 Far more than a mere rebuttal of Marx and Engels, Bernstein’s new Manifesto is a thoroughly researched and integrated presentation of (quoting the subtitle) “the historic, economic and philosophic case for laissez-faire” capitalism. It reviews the historical evidence showing capitalism’s enormous practical value, and integrates the philosophical evidence demonstrating why capitalism is morally superior, in every way, to statism. The book should be featured prominently on the shelf of any capitalist. Or socialist. Or libertarian. ...Anyone with a willingness to understand the relationship between ideas and the political realities in which we lead our lives. Andrew Bernstein is among the most capable and well-loved teachers of Ayn Rand’s ideas alive today. Currently a visiting professor of philosophy at Marist College, he has a veritable collection of “Outstanding Teacher” awards from the other universities at which he’s taught. He is also a frequent lecturer at college Objectivist clubs and a fixture at the Ayn Rand Institute’s summer seminars, where students rave about his ability to explain ideas with clarity and inspiration. His first book was Heart of a Pagan, a novel about an irrepressibly heroic basketball player named "Swoop." The book enjoyed no commercial success, but established Bernstein’s credentials as a writer of great passion and conviction. Bernstein also wrote the official Cliff Notes versions of Ayn Rand’s novels Anthem, The Fountainhead, and Atlas Shrugged. Not the most exciting project, probably, but one best done by someone with a solid understanding of Ayn Rand’s ideas and the ability to express them clearly and succinctly. For all these reasons, Bernstein is the perfect writer to craft a passionate and ringing manifesto of capitalism, elaborating at length upon Ayn Rand’s own philosophic insights, and presenting them in terms that anyone can understand and appreciate. Bernstein begins his manifesto inductively, with a brief review of the most important historical facts. This information constitutes much of the book's introductory chapter. Put simply: to all the countries that have embraced it fully, capitalism has brought unprecedented freedom and prosperity. There is an enormous disconnect between the facts of capitalism's nature and history — and the evaluation of these by many "progressive" writers and the millions whose thinking they influence. The facts of capitalism's nature and history are not unknown. Certainly the educated critics are well aware of them. Capitalism's enemies are simply unimpressed. Why? What is responsible for the great disconnect? Too often, freedom's supporters have limited themselves to responses that demonstrate capitalism's unparalleled ability to increase men's prosperity. While true and important, such defenses miss the essence of the criticism. It is as if a great dialogue regarding the most momentous issues held across a span of centuries has been conducted at cross purposes. The critics argue on moral grounds; the supporters on economic grounds. The critics, wedded to a moral code of self-sacrifice, are oblivious to capitalism's practical success. The supporters, equally wedded to such a code, are morally disarmed against the onslaught of their antagonists — and are reduced to the citation of empirical facts and figures. The supporters, unable to break free of the conventional creed urging selflessness, have too often regarded capitalism's inherent pursuit of self-interest as a guilty secret, akin to an unsavory skeleton in the family closet. The balance of the book, one could say, consists of capitalism's coming-out party. No longer locked in a back room of the mind, the moral basis for capitalism is finally given its proper hearing before the court of anyone willing to hear truth when it is spoken. In the opening chapters, Bernstein reviews capitalism's accomplishments in the real world. By "examining capitalism's essence, its predecessors, and its earliest days, [Part One of this book] provides sufficient factual evidence to establish the system's historic achievements and to refute the common misconceptions that have been fostered about its nature and its past" (22). In Part Two, Bernstein takes up the philosophical task: "the explanation of the rational moral theories necessary to understand capitalism's nature and achievements — and to finally assess them properly" (Ibid). Part Three addresses head-on some of the most chronic and false accusations against capitalism, namely, that it leads to war, imperialism and slavery. Each is examined and refuted, in turn, on the basis of historical evidence. And Part Four turns, finally, to the economic reasons for capitalism's thoroughgoing superiority to statism. Of this section of the book, Bernstein notes: "That economics is relegated to the end of this book ... represents no slap at the economists. Quite the contrary, for to a significant degree they have done their job superbly. It is time for the moralists and philosophers to do theirs" (23). My overall impression of the book can be summarized in one word: "Deft." Bernstein brings a skillfulness to the subject matter that few writers could match. The task of assimilating and integrating so much material — from economics to history to moral theory — is daunting on its own; but to succeed, beyond this, in providing such a compelling and readable treatise on the subject, is uniquely admirable. My chief gripes about the book are typographical. Overall, the book's presentation is quite professional, with easily readable type, an elegant layout, and fitting cover art. There are some typos, however; and the use of long dashes, in particular, was often inconsistent, switching back and forth between en dashes (–) and em (—) dashes, from one page to the next. A book like this one deserves to see multiple printings, and hopefully these errors will be fixed in a future printing. In the interim, for most readers, they will pose at most a minor nuisance. With The Capitalist Manifesto, Andrew Bernstein accomplishes several important goals, culturally and philosophically. First, he provides the resounding, uncompromising, and long-overdue answer to Marx and Engels's Communist Manifesto. He has given the definitive explanation of why statism is wrong in theory and an abysmal failure in practice. Second, Bernstein provides the much-needed amplification of and elaboration on one of Ayn Rand's most important philosophical contributions: her explanation, and defense, of the inescapable connection between capitalism and self-interest. Rand's elucidation of the moral foundation of capitalism remains one of her most enduring contributions, and in some ways it's strange that not more has been written on this subject by her successors. Here, Bernstein fills the gap ably, integrating history, economics, politics, and philosophy with skill and transparency. Finally — and perhaps most importantly — Bernstein's manifesto provides crucial guidance for today's so-called conservatives. The book's message to conservatives comes through loud and clear: If you want to defend capitalism — if you wish to promote the system of freedom and wealth — then learn to be consistent. Check your premises. Nearly fifty years after the publication of Atlas Shrugged, many conservatives continue their attempts to defend capitalism while simultaneously extolling self-sacrifice. To see how badly this has worked out, one need only observe the Republican party's steady and continuing slide into socialism, through their embrace of pork-barrel spending, entitlement programs, and other encroachments on property rights and individual freedom. The attempt to defend capitalism on the basis of religion and altruism just doesn't work. In the long run, this strategy will always fail, politically and culturally. This is why Bernstein's book is so timely and important. Despite capitalism's tremendous successes, it lacks the support it needs from its proponents — the moral support of a rational philosophy of life. The Capitalist Manifesto provides just this moral support. Buy a copy for yourself, for your friends, and for anyone else you know who needs to understand capitalism. You will be doing a favor for the world — and for yourself. ORDERING INFORMATION: The book is available from Amazon.com. Joshua Zader is a web designer and online application developer, with a background in clinical psychology. He is CEO of Atlas Web Development, as well as the owner of the Atlasphere. His personal blog is at Mudita Journal. To post comments, please log in first. The Atlasphere is a social networking site for admirers of Ayn Rand's novels, most notably The Fountainhead and Atlas Shrugged. In addition to our online magazine, we offer a member directory and a dating service. If you share our enjoyment of Ayn Rand's novels, please sign up or log in to post comments. I purchased The Capitalist Manifesto last year after reading Joshua's original review on this site. Yes, the book is THAT good. It has not only become a valued part of my library, but has served often as a reference. It is one of the best books I've ever read and will continue to recommend it to others. I gave this book for Christmas... the best gift I could think of sending. Thanks for a thorough and compelling review of Bernstein's book. I'll be buying and reading it. ©2003-2019 by The Atlasphere LLC. Site by Atlas Web Development.